This article is about the Louvre Museum. For the building, see Louvre Palace. For other uses, see Louvre (disambiguation). The Louvre (US: /ˈluːv(rə)/), or the Louvre Museum (French: Musée du Louvre [myze dy luvʁ] ( listen)), is the world's largest art museum and a historic monument in Paris, France. A central landmark of the city, it is located on the Right Bank of the Seine in the city's 1st arrondissement (district or ward). 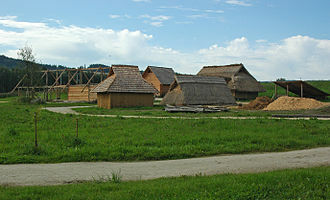 Approximately 38,000 objects from prehistory to the 21st century are exhibited over an area of 72,735 square metres (782,910 square feet). In 2018, the Louvre was the world's most visited art museum, receiving 10.2 million visitors. The museum is housed in the Louvre Palace, originally built as the Louvre castle in the late 12th to 13th century under Philip II. Remnants of the fortress are visible in the basement of the museum. Due to the urban expansion of the city, the fortress eventually lost its defensive function and, in 1546, was converted by Francis I into the main residence of the French Kings. The building was extended many times to form the present Louvre Palace. In 1682, Louis XIV chose the Palace of Versailles for his household, leaving the Louvre primarily as a place to display the royal collection, including, from 1692, a collection of ancient Greek and Roman sculpture. In 1692, the building was occupied by the Académie des Inscriptions et Belles-Lettres and the Académie Royale de Peinture et de Sculpture, which in 1699 held the first of a series of salons. The Académie remained at the Louvre for 100 years. During the French Revolution, the National Assembly decreed that the Louvre should be used as a museum to display the nation's masterpieces. The museum opened on 10 August 1793 with an exhibition of 537 paintings, the majority of the works being royal and confiscated church property. Because of structural problems with the building, the museum was closed in 1796 until 1801. 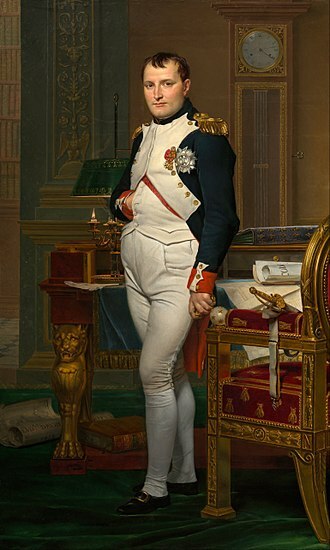 The collection was increased under Napoleon and the museum was renamed Musée Napoléon, but after Napoleon's abdication many works seized by his armies were returned to their original owners. The collection was further increased during the reigns of Louis XVIII and Charles X, and during the Second French Empire the museum gained 20,000 pieces. Holdings have grown steadily through donations and bequests since the Third Republic. The collection is divided among eight curatorial departments: Egyptian Antiquities; Near Eastern Antiquities; Greek, Etruscan and Roman Antiquities; Islamic Art; Sculpture; Decorative Arts; Paintings; Prints and Drawings. Below-ground portions of the medieval Louvre are still visible. The Louvre Palace, which houses the museum, was begun as a fortress by Philip II in the 12th century to protect the city from English soldiers which were in Normandy. Remnants of this castle are still visible in the crypt. Whether this was the first building on that spot is not known; it is possible that Philip modified an existing tower. According to the authoritative Grand Larousse encyclopédique, the name derives from an association with wolf hunting den (via Latin: lupus, lower Empire: lupara). In the 7th century, St. Fare, an abbess in Meaux, left part of her "Villa called Luvra situated in the region of Paris" to a monastery. ; this territory probably did not correspond exactly to the modern site, however. The Louvre Palace was altered frequently throughout the Middle Ages. In the 14th century, Charles V converted the building into a residence and in 1546, Francis I renovated the site in French Renaissance style. 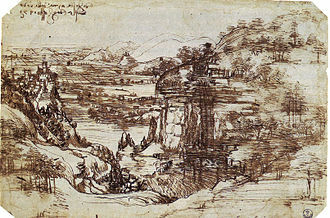 Francis acquired what would become the nucleus of the Louvre's holdings, his acquisitions including Leonardo da Vinci's Mona Lisa. 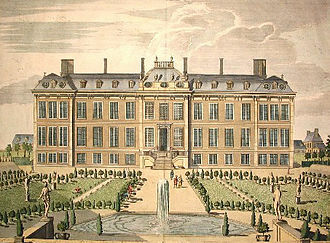 After Louis XIV chose Versailles as his residence in 1682, constructions slowed; however, the move permitted the Louvre to be used as a residence for artists, under Royal patronage. Four generations of Boulle were granted Royal patronage and resided in the Louvre in the following order: Pierre Boulle, Jean Boulle, Andre-Charles Boulle and his four sons (Jean-Philippe, Pierre-Benoît (c.1683-1741), Charles-André (1685–1749) and Charles-Joseph (1688–1754)), after him. André-Charles Boulle (11 November 1642 – 29 February 1732) is the most famous French cabinetmaker and the preeminent artist in the field of marquetry, also known as "Inlay". Boulle was "the most remarkable of all French cabinetmakers". 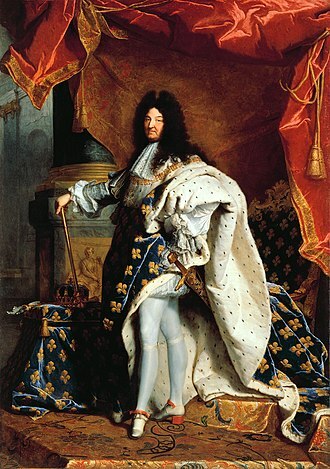 He was commended to Louis XIV of France, the "Sun King", by Jean-Baptiste Colbert (29 August 1619 – 6 September 1683) as being "the most skilled craftsman in his profession". Before the fire of 1720 destroyed them, André-Charles Boulle held priceless works of art in the Louvre, including forty-eight drawings by Raphael'. By the mid-18th century there were an increasing number of proposals to create a public gallery, with the art critic La Font de Saint-Yenne publishing, in 1747, a call for a display of the royal collection. On 14 October 1750, Louis XV agreed and sanctioned a display of 96 pieces from the royal collection, mounted in the Galerie royale de peinture of the Luxembourg Palace. A hall was opened by Le Normant de Tournehem and the Marquis de Marigny for public viewing of the Tableaux du Roy on Wednesdays and Saturdays, and contained Andrea del Sarto's Charity and works by Raphael; Titian; Veronese; Rembrandt; Poussin or Van Dyck, until its closing in 1780 as a result of the gift of the palace to the Count of Provence (the future king, Louis XVIII) by the king in 1778. Under Louis XVI, the royal museum idea became policy. 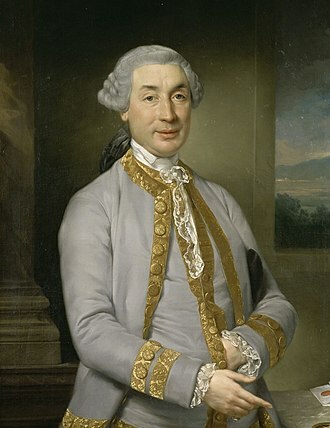 The comte d'Angiviller broadened the collection and in 1776 proposed conversion of the Grande Galerie of the Louvre – which contained maps – into the "French Museum". Many proposals were offered for the Louvre's renovation into a museum; however, none was agreed on. Hence the museum remained incomplete until the French Revolution. During the French Revolution the Louvre was transformed into a public museum. In May 1791, the Assembly declared that the Louvre would be "a place for bringing together monuments of all the sciences and arts". On 10 August 1792, Louis XVI was imprisoned and the royal collection in the Louvre became national property. Because of fear of vandalism or theft, on 19 August, the National Assembly pronounced the museum's preparation as urgent. In October, a committee to "preserve the national memory" began assembling the collection for display. The museum opened on 10 August 1793, the first anniversary of the monarchy's demise. The public was given free accessibility on three days per week, which was "perceived as a major accomplishment and was generally appreciated". The collection showcased 537 paintings and 184 objects of art. Three quarters were derived from the royal collections, the remainder from confiscated émigrés and Church property (biens nationaux). To expand and organize the collection, the Republic dedicated 100,000 livres per year. In 1794, France's revolutionary armies began bringing pieces from Northern Europe, augmented after the Treaty of Tolentino (1797) by works from the Vatican, such as Laocoön and His Sons and the Apollo Belvedere, to establish the Louvre as a museum and as a "sign of popular sovereignty". The early days were hectic; privileged artists continued to live in residence, and the unlabelled paintings hung "frame to frame from floor to ceiling". The structure itself closed in May 1796 due to structural deficiencies. It reopened on 14 July 1801, arranged chronologically and with new lighting and columns. Under Napoleon I, a northern wing paralleling the Grande Galerie was begun, and the collection grew through successful military campaigns. Following the Egyptian campaign of 1798–1801, Napoléon appointed the museum's first director, Dominique Vivant Denon. In tribute, the museum was renamed the "Musée Napoléon" in 1803, and acquisitions were made of Spanish, Austrian, Dutch, and Italian works, either as spoils or through treaties such as the Treaty of Tolentino. At the end of Napoleon's First Italian Campaign in 1797, the Treaty of Campo Formio was signed with Count Philipp von Cobenzl of the Austrian Monarchy. This treaty not only marked the completion of Napoleon's conquest of Italy, but also the end of the first phases of the French Revolutionary Wars. 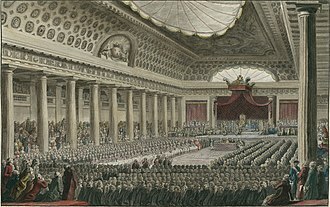 Under this treaty, Italian cities were required to contribute pieces of art and patrimony to take part in Napoleon's "parades of booty" through Paris before being put into the Louvre Museum. One of the most famous pieces taken under this program was the Horses of Saint Mark. The four antique bronze horses, which had adorned the basilica of San Marco in Venice after the sack of Constantinople in 1204, were brought to Paris to reside atop Napoleon's Arc du Carrousel in Paris in 1797. Several churches and palaces, including Saint Mark's Basilica, were looted by the French, which outraged the Italians and their artistic and cultural sensibilities. In 1797, the Treaty of Tolentino was signed by Napoleon, and two statues, the Nile and Tiber, were taken to Paris. These statues had previously been in the Vatican, and both were housed in the Louvre until 1815. After the defeat of Napoleon, the Nile was returned to Italy. However, the Tiber remained in the Louvre Museum and can be seen in the collections today. The Italian Peninsula was not the only region from which Napoleon took art. Under the Directory government of the 1790s, Napoleon (then a General) led an expedition to Egypt. The campaign was an expansionist effort on the part of the government, but the Directory had another goal to make Paris the center of art, science, and culture. The Directory wanted France to assume responsibility for liberating the works of art they deemed in danger in order to protect and nationalize the heritage and culture of their subjects. As a result, there were teams of artists and scientists who accompanied the armies into battle equipped with lists of paintings, sculptures, and other pieces of patrimony that would be collected, crated, and shipped back to France. Dominique Vivant Denon was Napoleon's art advisor, and accompanied him on the expedition to Egypt. Through his initiative, the Valley of the Kings in Egypt was discovered and studied extensively. As a result, he was later installed by Napoleon as the director of Musée Napoléon, formerly the Louvre, cementing the status of the museum as a center for global patrimony and storehouse for cultural heritage. One of the most important discoveries made during Napoleon's campaign in Egypt was the Rosetta Stone. 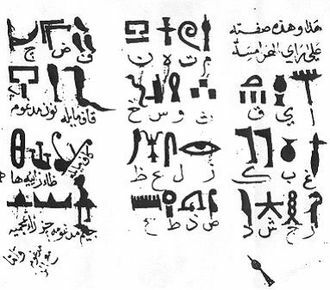 It was discovered in 1799, and eventually led to the ability to decipher ancient hieroglyphs. Although the Rosetta Stone was discovered by the French, it actually never made it to the Louvre Museum. It was seized by British Forces following the defeat of Napoleon in Egypt and the subsequent signing of the Treaty of Alexandria in 1801. It is now on display at the British Museum. After the French defeat at Waterloo, the works' former owners sought their return. The Louvre's administrators were loath to comply and hid many works in their private collections. In response, foreign states sent emissaries to London to seek help, and many pieces were returned, even some that had been restored by the Louvre. In 1815 Louis XVIII finally concluded agreements with the Austrian government for the keeping of pieces such as Veronese's Wedding at Cana which was exchanged for a large Le Brun or the repurchase of the Albani collection. During the Restoration (1814–30), Louis XVIII and Charles X between them added 135 pieces at a cost of 720,000 francs and created the department of Egyptian antiquities curated by Champollion, increased by more than 7,000 works with the acquisition of antiquities in the Edme-Antoine Durand, the Egyptian collection of Henry Salt or the second collection former by Bernardino Drovetti. This was less than the amount given for rehabilitation of Versailles, and the Louvre suffered relative to the rest of Paris. After the creation of the French Second Republic in 1848, the new government allocated two million francs for repair work and ordered the completion of the Galerie d'Apollon, the Salon Carré, and the Grande Galérie. In 1861, Louis-Napoléon Bonaparte bought 11,835 artworks including 641 paintings, Greek gold and other antiquities of the Campana collection. During the Second French Empire, between 1852 and 1870, the French economy grew; by 1870 the museum had added 20,000 new pieces to its collections, and the Pavillon de Flore and the Grande Galérie were remodelled under architects Louis Visconti and Hector Lefuel. The Louvre was damaged during the suppression of the Paris Commune. On 23 May 1871, as the French Army advanced into Paris, a force of Communards led by Jules Bergeret set fire to the adjoining Tuileries Palace. The fire burned for forty-eight hours, entirely destroying the interior of the palace and spreading to the museum next to it. The library of the museum and some of the adjoining halls were destroyed, but the museum was saved by the efforts of Paris firemen and museum employees. During the Third Republic (1870–1940) the Louvre acquired new pieces mainly via donations and gifts. The Société des Amis du Louvre (established in 1897) donated the Pietà of Villeneuve-lès-Avignon, and in 1863 an expedition uncovered the sculpture Winged Victory of Samothrace in the Aegean Sea. This piece, though heavily damaged, has been prominently displayed since 1884. The 583-item Collection La Caze donated in 1869, included works by Chardin; Fragonard; Rembrandt – such as Bathsheba at Her Bath – and Gilles by Watteau. Museum expansion slowed after World War I, and the collection did not acquire many significant new works; exceptions were Georges de La Tour's Saint Thomas and Baron Edmond de Rothschild's (1845–1934) 1935 donation of 4,000 prints, 3,000 drawings, and 500 illustrated books. At the beginning of World War II the museum removed most of the art and hid valuable pieces. When Germany occupied the Sudetenland, many important artworks such as the Mona Lisa were temporarily moved to the Château de Chambord. When war was formally declared a year later, most of the museum's paintings were sent there as well. Select sculptures such as Winged Victory of Samothrace and the Venus de Milo were sent to the Château de Valençay. On 27 August 1939, after two days of packing, truck convoys began to leave Paris. By 28 December, the museum was cleared of most works, except those that were too heavy and "unimportant paintings [that] were left in the basement". In early 1945, after the liberation of France, art began returning to the Louvre. By 1874, the Louvre Palace had achieved its present form of an almost rectangular structure with the Sully Wing to the east containing the Cour Carrée (Square Court) and the oldest parts of the Louvre; and two wings which wrap the Cour Napoléon, the Richelieu Wing to the north and the Denon Wing, which borders the Seine to the south. In 1983, French President François Mitterrand proposed, as one of his Grands Projets, the Grand Louvre plan to renovate the building and relocate the Finance Ministry, allowing displays throughout the building. Architect I. M. Pei was awarded the project and proposed a glass pyramid to stand over a new entrance in the main court, the Cour Napoléon. The pyramid and its underground lobby were inaugurated on 15 October 1988 and the Louvre Pyramid was completed in 1989. The second phase of the Grand Louvre plan, the Pyramide Inversée (Inverted Pyramid), was completed in 1993. As of 2002, attendance had doubled since completion. The Musée du Louvre contains more than 380,000 objects and displays 35,000 works of art in eight curatorial departments with more than 60,600 square metres (652,000 sq ft) dedicated to the permanent collection. The Louvre exhibits sculptures, objets d'art, paintings, drawings, and archaeological finds. It is the world's most visited museum, averaging 15,000 visitors per day, 65 percent of whom are foreign tourists. After architects Mario Bellini and Rudy Ricciotti had won an international competition to create its new galleries for Islamic art, the new 3,000 sq m pavilion eventually opened in 2012, consisting of ground- and lower-ground-level interior spaces topped by a golden, undulating roof (fashioned from almost 9,000 steel tubes that form an interior web) that seems to float within the neo-Classical Visconti Courtyard in the middle of the Louvre's south wing. The galleries, which the museum had initially hoped to open by 2009, represent the first major architectural intervention at the Louvre since the addition of I.M. Pei's glass pyramid in 1989. On 5 February 2015, about one hundred archaeologists, protesting against commercial private involvement to protect France's heritage, blocked Louvre's ticket desks to facilitate free access to the museum. At least one announcement reading "Free entrance offered by the archeologists" has been attached to the ticket desk and a number of people visited the museum free of charge. Leonardo da Vinci's Mona Lisa is the Louvre's most popular attraction. The Louvre is owned by the French government; however, since the 1990s it has become more independent. Since 2003, the museum has been required to generate funds for projects. By 2006, government funds had dipped from 75 percent of the total budget to 62 percent. Every year, the Louvre now raises as much as it gets from the state, about €122 million. The government pays for operating costs (salaries, safety and maintenance), while the rest – new wings, refurbishments, acquisitions – is up to the museum to finance. A further €3 million to €5 million a year is raised by the Louvre from exhibitions that it curates for other museums, while the host museum keeps the ticket money. As the Louvre became a point of interest in the book The Da Vinci Code and the 2006 film based on the book, the museum earned $2.5 million by allowing filming in its galleries. In 2008, the French government provided $180 million of the Louvre's yearly $350 million budget; the remainder came from private contributions and ticket sales. The Louvre employs a staff of 2,000 led by Director Jean-Luc Martinez, who reports to the French Ministry of Culture and Communications. Martinez replaced Henri Loyrette in April 2013. Under Loyrette, who replaced Pierre Rosenberg in 2001, the Louvre has undergone policy changes that allow it to lend and borrow more works than before. In 2006, it loaned 1,300 works, which enabled it to borrow more foreign works. From 2006 to 2009, the Louvre lent artwork to the High Museum of Art in Atlanta, Georgia, and received a $6.9 million payment to be used for renovations. In 2012, the Louvre and the Fine Arts Museums of San Francisco announced a five-year collaboration on exhibitions, publications, art conservation and educational programming. The €98.5 million expansion of the Islamic Art galleries in 2012 received state funding of €31 million, as well as €17 million from the Alwaleed Bin Talal Foundation founded by the eponymous Saudi prince. The republic of Azerbaijan, the Emir of Kuwait, the Sultan of Oman and King Mohammed VI of Morocco donated in total €26 million. In addition, the opening of the Louvre Abu Dhabi is supposed to provide €400 million over the course of 30 years for its use of the museum's brand. Loyrette has tried to improve weak parts of the collection through income generated from loans of art and by guaranteeing that "20% of admissions receipts will be taken annually for acquisitions". He has more administrative independence for the museum and achieved 90 percent of galleries to be open daily, as opposed to 80 percent previously. He oversaw the creation of extended hours and free admission on Friday nights and an increase in the acquisition budget to $36 million from $4.5 million. In 2004, French officials decided to build a satellite museum on the site of an abandoned coal pit in the former mining town of Lens to relieve the crowded Paris Louvre, increase total museum visits, and improve the industrial north's economy. Six cities were considered for the project: Amiens, Arras, Boulogne-sur-Mer, Calais, Lens, and Valenciennes. In 2004, French Prime Minister Jean-Pierre Raffarin chose Lens to be the site of the new building, the Louvre-Lens. Japanese architects SANAA were selected to design the Lens project in 2005. Museum officials predicted that the new building, capable of receiving about 600 works of art, would attract up to 500,000 visitors a year when it opened in 2012. On 8 November 2017, a direct extension of the Louvre, Louvre Abu Dhabi, opened its doors to the public in the city of Abu Dhabi. A 30-year agreement, signed by French Culture Minister Renaud Donnedieu de Vabres and Sheik Sultan bin Tahnoon Al Nahyan, established the museum on Saadiyat Island in Abu Dhabi in exchange for €832,000,000 (US$1.3 billion). The Louvre Abu Dhabi, designed by the French architect Jean Nouvel and the engineering firm of Buro Happold, occupy 24,000 square metres (260,000 sq ft) and is covered by an iconic metallic roof designed to cast rays of light mimicking sunlight passing through date palm fronds in an oasis. France agreed to rotate between 200 and 300 artworks during a 10-year period; to provide management expertise; and to provide four temporary exhibitions a year for 15 years. The art will come from multiple museums, including the Louvre, the Georges Pompidou Centre, the Musée d'Orsay, Versailles, the Musée Guimet, the Musée Rodin, and the Musée du quai Branly. In March 2018 an exhibition of dozens of artworks and relics belonging to France’s Louvre Museum was opened to visitors in Tehran, as a result of an agreement between Iranian and French presidents in 2016. 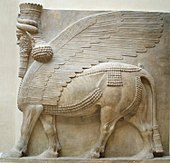 In the Louvre, two departments were allocated to the antiquities of the Iranian civilization, and the managers of the two departments visited Tehran. Relics belonging to Ancient Egypt, Rome and Mesopotamia as well as French royal items were showcased at the Tehran exhibition. Iran’s National Museum building was designed and constructed by French architect André Godard. Following its time in Tehran, the exhibition is set to be held in the Khorasan Grand Museum in Mashhad, northeastern Iran in June 2018. In 2009, Minister of Culture Frédéric Mitterrand approved a plan that would have created a storage facility 30 km (19 mi) northwest of Paris to hold objects from the Louvre and two other national museums in Paris's flood zone, the Musée du Quai Branly and the Musée d'Orsay; the plan was later scrapped. In 2013, his successor Aurélie Filippetti announced that the Louvre would move more than 250,000 works of art held in a 20,000 square metres (220,000 sq ft) basement storage area in Liévin; the cost of the project, estimated at €60 million, will be split between the region (49%) and the Louvre (51%). The Louvre will be the sole owner and manager of the store. In July 2015, a team led by British firm Rogers Stirk Harbour + Partners was selected to design the complex, which will have light-filled work spaces under one vast, green roof. The Louvre is involved in controversies that surround cultural property seized under Napoleon I, as well as during World War II by the Nazis. During Nazi occupation, thousands of artworks were stolen. But after the war, 61,233 articles of more than 150,000 seized artworks returned to France and were assigned to the Louvre's Office des Biens Privés. In 1949, it entrusted 2,130 unclaimed pieces (including 1,001 paintings) to the Direction des Musées de France in order to keep them under appropriate conditions of conservation until their restitution and meanwhile classified them as MNRs (Musées Nationaux Recuperation or, in English, the National Museums of Recovered Artwork). Some 10% to 35% of the pieces are believed to come from Jewish spoliations and until the identification of their rightful owners, which declined at the end of the 1960s, they are registered indefinitely on separate inventories from the museum's collections. They were exhibited in 1946 and shown all together to the public during four years (1950–1954) in order to allow rightful claimants to identify their properties, then stored or displayed, according to their interest, in several French museums including the Louvre. From 1951 to 1965, about 37 pieces were restituted. Since November 1996, the partly illustrated catalogue of 1947–1949 has been accessible online and completed. In 1997, Prime Minister Alain Juppé initiated the Mattéoli Commission, headed by Jean Mattéoli, to investigate the matter and according to the government, the Louvre is in charge of 678 pieces of artwork still unclaimed by their rightful owners. During the late 1990s, the comparison of the American war archives, which had not been done before, with the French and German ones as well as two court cases which finally settled some of the heirs' rights (Gentili di Giuseppe and Rosenberg families) allowed more accurate investigations. Since 1996, the restitutions, according sometimes to less formal criteria, concerned 47 more pieces (26 paintings, with 6 from the Louvre including a then displayed Tiepolo), until the last claims of French owners and their heirs ended again in 2006. According to Serge Klarsfeld, since the now complete and constant publicity which the artworks got in 1996, the majority of the French Jewish community is nevertheless in favour of the return to the normal French civil rule of prescription acquisitive of any unclaimed good after another long period of time and consequently to their ultimate integration into the common French heritage instead of their transfer to foreign institutions like during World War II. Napoleon's campaigns acquired Italian pieces by treaties, as war reparations, and Northern European pieces as spoils as well as some antiquities excavated in Egypt, though the vast majority of the latter were seized as war reparations by the British army and are now part of collections of the British Museum. On the other hand, the Dendera zodiac is, like the Rosetta Stone, claimed by Egypt even though it was acquired in 1821, before the Egyptian Anti-export legislation of 1835. The Louvre administration has thus argued in favor of retaining this item despite requests by Egypt for its return. The museum participates too in arbitration sessions held via UNESCO's Committee for Promoting the Return of Cultural Property to Its Countries of Origin. The museum consequently returned in 2009 five Egyptian fragments of frescoes (30 cm x 15 cm each) whose existence of the tomb of origin had only been brought to the authorities attention in 2008, eight to five years after their good-faith acquisition by the museum from two private collections and after the necessary respect of the procedure of déclassement from French public collections before the Commission scientifique nationale des collections des musées de France. The Musée du Louvre contains about 460,000 objects and displays 35,000 works of art in eight curatorial departments. The department, comprising over 50,000 pieces, includes artifacts from the Nile civilizations which date from 4,000 BC to the 4th century AD. The collection, among the world's largest, overviews Egyptian life spanning Ancient Egypt, the Middle Kingdom, the New Kingdom, Coptic art, and the Roman, Ptolemaic, and Byzantine periods. The department's origins lie in the royal collection, but it was augmented by Napoleon's 1798 expeditionary trip with Dominique Vivant, the future director of the Louvre. After Jean-François Champollion translated the Rosetta Stone, Charles X decreed that an Egyptian Antiquities department be created. Champollion advised the purchase of three collections, formed by Edmé-Antoine Durand, Henry Salt and Bernardino Drovet; these additions added 7,000 works. Growth continued via acquisitions by Auguste Mariette, founder of the Egyptian Museum in Cairo. 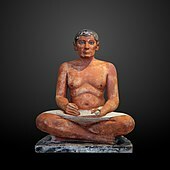 Mariette, after excavations at Memphis, sent back crates of archaeological finds including The Seated Scribe. Guarded by the Large Sphinx (c. 2000 BC), the collection is housed in more than 20 rooms. Holdings include art, papyrus scrolls, mummies, tools, clothing, jewelry, games, musical instruments, and weapons. Pieces from the ancient period include the Gebel el-Arak Knife from 3400 BC, The Seated Scribe, and the Head of King Djedefre. Middle Kingdom art, "known for its gold work and statues", moved from realism to idealization; this is exemplified by the schist statue of Amenemhatankh and the wooden Offering Bearer. The New Kingdom and Coptic Egyptian sections are deep, but the statue of the goddess Nephthys and the limestone depiction of the goddess Hathor demonstrate New Kingdom sentiment and wealth. Near Eastern antiquities, the second newest department, dates from 1881 and presents an overview of early Near Eastern civilization and "first settlements", before the arrival of Islam. The department is divided into three geographic areas: the Levant, Mesopotamia (Iraq), and Persia (Iran). The collection's development corresponds to archaeological work such as Paul-Émile Botta's 1843 expedition to Khorsabad and the discovery of Sargon II's palace. These finds formed the basis of the Assyrian museum, the precursor to today's department. The museum contains exhibits from Sumer and the city of Akkad, with monuments such as the Prince of Lagash's Stele of the Vultures from 2450 BC and the stele erected by Naram-Sin, King of Akkad, to celebrate a victory over barbarians in the Zagros Mountains. The 2.25-metre (7.38 ft) Code of Hammurabi, discovered in 1901, displays Babylonian Laws prominently, so that no man could plead their ignorance. The 18th-century BC mural of the Investiture of Zimrilim and the 25th-century BC Statue of Ebih-Il found in the ancient city-state of Mari are also on display at the museum. The Persian portion of Louvre contains work from the archaic period, like the Funerary Head and the Persian Archers of Darius I. This section also contains rare objects from Persepolis which were also lent to the British Museum for its Ancient Persia exhibition in 2005. The Greek, Etruscan, and Roman department displays pieces from the Mediterranean Basin dating from the Neolithic to the 6th century. The collection spans from the Cycladic period to the decline of the Roman Empire. This department is one of the museum's oldest; it began with appropriated royal art, some of which was acquired under Francis I. Initially, the collection focused on marble sculptures, such as the Venus de Milo. Works such as the Apollo Belvedere arrived during the Napoleonic Wars, but these pieces were returned after Napoleon I's fall in 1815. In the 19th century, the Louvre acquired works including vases from the Durand collection, bronzes such as the Borghese Vase from the Bibliothèque nationale. The archaic is demonstrated by jewellery and pieces such as the limestone Lady of Auxerre, from 640 BC; and the cylindrical Hera of Samos, circa 570–560 BC. After the 4th century BC, focus on the human form increased, exemplified by the Borghese Gladiator. The Louvre holds masterpieces from the Hellenistic era, including The Winged Victory of Samothrace (190 BC) and the Venus de Milo, symbolic of classical art. The long Galerie Campana displays an outstanding collection of more than one thousand Greek potteries. In the galleries paralleling the Seine, much of the museum's Roman sculpture is displayed. The Roman portraiture is representative of that genre; examples include the portraits of Agrippa and Annius Verus; among the bronzes is the Greek Apollo of Piombino. The Islamic art collection, the museum's newest, spans "thirteen centuries and three continents". These exhibits, comprising ceramics, glass, metalware, wood, ivory, carpet, textiles, and miniatures, include more than 5,000 works and 1,000 shards. Originally part of the decorative arts department, the holdings became separate in 2003. 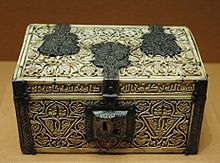 Among the works are the Pyxide d'al-Mughira, a 10th century ivory box from Andalusia; the Baptistery of Saint-Louis, an engraved brass basin from the 13th or 14th century Mamluk period; and the 10th century Shroud of Saint-Josse from Iran. The collection contains three pages of the Shahnameh, an epic book of poems by Ferdowsi in Persian, and a Syrian metalwork named the Barberini Vase. The sculpture department comprises work created before 1850 that does not belong in the Etruscan, Greek, and Roman department. The Louvre has been a repository of sculpted material since its time as a palace; however, only ancient architecture was displayed until 1824, except for Michelangelo's Dying Slave and Rebellious Slave. Initially the collection included only 100 pieces, the rest of the royal sculpture collection being at Versailles. It remained small until 1847, when Léon Laborde was given control of the department. Laborde developed the medieval section and purchased the first such statues and sculptures in the collection, King Childebert and stanga door, respectively. The collection was part of the Department of Antiquities but was given autonomy in 1871 under Louis Courajod, a director who organized a wider representation of French works. In 1986, all post-1850 works were relocated to the new Musée d'Orsay. The Grand Louvre project separated the department into two exhibition spaces; the French collection is displayed in the Richelieu wing, and foreign works in the Denon wing. The collection's overview of French sculpture contains Romanesque works such as the 11th-century Daniel in the Lions' Den and the 12th-century Virgin of Auvergne. In the 16th century, Renaissance influence caused French sculpture to become more restrained, as seen in Jean Goujon's bas-reliefs, and Germain Pilon's Descent from the Cross and Resurrection of Christ. The 17th and 18th centuries are represented by Gian Lorenzo Bernini's 1640–1 Bust of Cardinal Richelieu, Étienne Maurice Falconet's Woman Bathing and Amour menaçant, and François Anguier's obelisks. Neoclassical works includes Antonio Canova's Psyche Revived by Cupid's Kiss (1787). The 18th and 19th centuries are represented by the French sculptor Alfred Barye. The Objets d'art collection spans the time from the Middle Ages to the mid-19th century. The department began as a subset of the sculpture department, based on royal property and the transfer of work from the Basilique Saint-Denis, the burial ground of French monarchs that held the Coronation Sword of the Kings of France. Among the budding collection's most prized works were pietre dure vases and bronzes. The Durand collection's 1825 acquisition added "ceramics, enamels, and stained glass", and 800 pieces were given by Pierre Révoil. The onset of Romanticism rekindled interest in Renaissance and Medieval artwork, and the Sauvageot donation expanded the department with 1,500 middle-age and faïence works. In 1862, the Campana collection added gold jewelry and maiolicas, mainly from the 15th and 16th centuries. 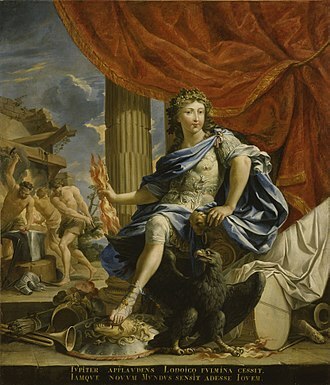 The works are displayed on the Richelieu Wing's first floor and in the Apollo Gallery, named by the painter Charles Le Brun, who was commissioned by Louis XIV (the Sun King) to decorate the space in a solar theme. The medieval collection contains the coronation crown of Louis XIV, Charles V's sceptre, and the 12th century porphyry vase. The Renaissance art holdings include Giambologna's bronze Nessus and Deianira and the tapestry Maximillian's Hunt. From later periods, highlights include Madame de Pompadour's Sèvres vase collection and Napoleon III's apartments. In September 2000, the Louvre Museum dedicated the Gilbert Chagoury and Rose-Marie Chagoury Gallery to display tapestries donated by the Chagourys, including a 16th-century six-part tapestry suite, sewn with gold and silver threads representing sea divinities, which was commissioned in Paris for Colbert de Seignelay, Secretary of State for the Navy. The Mona Lisa (Leonardo da Vinci), oil on panel, 1503–1519, probably completed while the artist was at the court of Francis I. The painting collection has more than 7,500 works from the 13th century to 1848 and is managed by 12 curators who oversee the collection's display. Nearly two-thirds are by French artists, and more than 1,200 are Northern European. The Italian paintings compose most of the remnants of Francis I and Louis XIV's collections, others are unreturned artwork from the Napoleon era, and some were bought. The collection began with Francis, who acquired works from Italian masters such as Raphael and Michelangelo and brought Leonardo da Vinci to his court. After the French Revolution, the Royal Collection formed the nucleus of the Louvre. When the d'Orsay train station was converted into the Musée d'Orsay in 1986, the collection was split, and pieces completed after the 1848 Revolution were moved to the new museum. French and Northern European works are in the Richelieu wing and Cour Carrée; Spanish and Italian paintings are on the first floor of the Denon wing. Exemplifying the French School are the early Avignon Pietà of Enguerrand Quarton; the anonymous painting of King Jean le Bon (c.1360), possibly the oldest independent portrait in Western painting to survive from the postclassical era; Hyacinthe Rigaud's Louis XIV; Jacques-Louis David's The Coronation of Napoleon; Théodore Géricault's The Raft of the Medusa; and Eugène Delacroix's Liberty Leading the People. Nicolas Poussin, the Le Nain brothers, Philippe de Champaigne, Le Brun, La Tour, Watteau, Fragonard, Ingres, Corot, and Delacroix are well represented. Northern European works include Johannes Vermeer's The Lacemaker and The Astronomer; Caspar David Friedrich's The Tree of Crows; Rembrandt's The Supper at Emmaus, Bathsheba at Her Bath, and The Slaughtered Ox. The Italian holdings are notable, particularly the Renaissance collection. The works include Andrea Mantegna and Giovanni Bellini's Calvarys, which reflect realism and detail "meant to depict the significant events of a greater spiritual world". The High Renaissance collection includes Leonardo da Vinci's Mona Lisa, Virgin and Child with St. Anne, St. John the Baptist, and Madonna of the Rocks. Caravaggio is represented by The Fortune Teller and Death of the Virgin. From 16th century Venice, the Louvre displays Titian's Le Concert Champetre, The Entombment and The Crowning with Thorns. The La Caze Collection, a bequest to the Musée du Louvre in 1869 by Louis La Caze, was the largest contribution of a person in the history of the Louvre. La Caze gave 584 paintings of his personal collection to the museum. The bequest included Antoine Watteau's Commedia dell'arte player of Pierrot ("Gilles"). In 2007, this bequest was the topic of the exhibition "1869: Watteau, Chardin... entrent au Louvre. La collection La Caze". Some of the best known paintings of the museum have been digitized by the French Center for Research and Restoration of the Museums of France. The prints and drawings department encompasses works on paper. The origins of the collection were the 8,600 works in the Royal Collection (Cabinet du Roi), which were increased via state appropriation, purchases such as the 1,200 works from Fillipo Baldinucci's collection in 1806, and donations. The department opened on 5 August 1797, with 415 pieces displayed in the Galerie d'Apollon. The collection is organized into three sections: the core Cabinet du Roi, 14,000 royal copper printing-plates, and the donations of Edmond de Rothschild, which include 40,000 prints, 3,000 drawings, and 5,000 illustrated books. The holdings are displayed in the Pavillon de Flore; due to the fragility of the paper medium, only a portion are displayed at one time. The museum lies in the center of Paris on the Right Bank, in the 1st arrondissement. It was home to the former Tuileries Palace, which closed off the western end of the Louvre entrance courtyard, but was heavily damaged by fire during the Paris Commune of 1871 and later demolished. The adjacent Tuileries Gardens, created in 1564 by Catherine de' Medici, was designed in 1664 by André Le Nôtre. The gardens house the Galerie nationale du Jeu de Paume, a contemporary art exhibition space which was used to store confiscated Jewish cultural property during the 1940 to 1944 German occupation of France. Parallel to the Jeu de Paume is the Orangerie, home to the famous Water Lilies paintings by Claude Monet. The Louvre is slightly askew of the Historic Axis (Axe historique), a roughly eight-kilometre (five-mile) architectural line bisecting the city. It begins on the east in the Louvre courtyard and runs west along the Champs-Élysées. In 1871, the burning of the Tuileries Palace by the Paris Commune revealed that the Louvre was slightly askew of the Axe despite past appearances to the contrary. The Louvre can be reached by the Palais Royal – Musée du Louvre Métro or the Louvre-Rivoli stations. The Louvre has three entrances: the main entrance at the pyramid, an entrance from the Carrousel du Louvre underground shopping mall, and an entrance at the Porte des Lions (near the western end of the Denon wing). Under the main entrance to the museum is the Carrousel du Louvre, a shopping mall operated by Unibail-Rodamco. Among other stores, it has the first Apple Store in France, and a McDonald's restaurant, the presence of which has created controversy. The use of cameras and video recorders is permitted inside, but flash photography is forbidden. ^ a b "10,2 millions de visiteurs au Louvre en 2018". Louvre.fr (in French). 3 January 2019. Retrieved 3 January 2019. ^ The New Oxford American Dictionary gives the respelling "/'loov(rə)/", which has been converted to its IPA equivalent. The portion within parentheses indicates a variant pronunciation. ^ "The “Pyramid” Project (2014-2016)", press release of the Musée du Louvre, 18 September 2014, p. 29. Archive copy. ^ "Louvre Museum". Inexhibit. Retrieved 15 October 2016. ^ "Louvre Website- Chateau to Museum, 1672 and 1692". Louvre.fr. Archived from the original on 15 June 2011. Retrieved 21 August 2011. ^ "Louvre Website- Chateau to Museum 1692". Louvre.fr. Archived from the original on 15 June 2011. Retrieved 21 August 2011. ^ In Larousse Nouveau Dictionnaire étymologique et historique, Librairie Larousse, Paris, 1971, p. 430: ***loup 1080, Roland (leu, forme conservée dans à la queue leu leu, Saint Leu, etc. ); du lat. lupus; loup est refait sur le fém. louve, où le *v* a empêché le passage du *ou* à *eu* (cf. Louvre, du lat. pop. lupara)*** the etymology of the word louvre is from lupara, feminine (pop. Latin) form of lupus. ^ In Lebeuf (Abbé), Fernand Bournon, Histoire de la ville et de tout le diocèse de Paris par l'abbé Lebeuf, Vol. 2, Paris: Féchoz et Letouzey, 1883, p. 296: "Louvre". ^ a b Chaundy, Bob (29 September 2006). "Faces of the Week". BBC. Retrieved 5 October 2007. ^ "Jean Philippe Boulle, Son of André-Charles Boulle". V&A. ^ "Death of André-Charles Boulle". Mercure de France. ^ "The French cabinetmaker who is generally considered to be the preeminent artist in the field of marquetry, even "the most remarkable of all French cabinetmakers."". Google Arts and Culture. ^ "Masters of marquetry in the 17th century: Boulle". Khanacademy. ^ "André-Charles Boulle - Inlay". Pinterest. ^ Theodore Dell, The Frick Collection, V: Furniture in the Frick Collection (1992:187). ^ Monaghan, Sean M.; Rodgers, Michael (2000). "French Sculpture 1800–1825, Canova". 19th Century Paris Project. School of Art and Design, San Jose State University. Archived from the original on 20 April 2008. Retrieved 24 April 2008. ^ Swetnam-Burland, Molly (2009). "Egypt Embodied: The Vatican Nile". American Journal of Archaeology: 440. JSTOR 20627596. ^ Mignot, p. 69. According to Mignot, Mantegna's Calvary, Veronese's The Wedding at Cana|The Marriage of Cana, and Rogier van der Weyden's Annunciation were not returned. ^ "Paolo Veronese". The Gentleman's Magazine. No. December 1867. A. Dodd and A. Smith. p. 741. ^ Johns, Christopher M. S. (1998). Antonio Canova and the Politics of Patronage in Revolutionary and Napoleonic Europe. University of California Press. p. 190. ISBN 9780520212015. ^ Life (4 November 1940), p. 39. ^ Alan Riding, And the Show Went On: Cultural Life in Nazi-Occupied Paris. Alfred A Knopf, New York: 2010. p34. ^ Matila Simon, "The battle of the Louvre;: The struggle to save French art in World War II". Hawthorn Books, 1971. p. 23. ^ a b "Online Extra: Q&A with the Louvre's Henri Loyrette". Business Week Online. 17 June 2002. Archived from the original on 10 December 2013. Retrieved 26 April 2015. ^ "Œuvres". Musée du Louvre. Archived from the original on 15 April 2008. Retrieved 27 April 2008. ^ a b c "New Boss at Louvre's helm". BBC News. 17 June 2002. Retrieved 25 September 2008. ^ a b Gareth Harris (13 September 2012), Islamic art, covered Financial Times. ^ Carol Vogel (19 September 2012), The Louvre's New Islamic Galleries Bring Riches to Light The New York Times. ^ Denis Bocquet. "Structural Innovation and the Stakes of Heritage: The Bellini-Ricciotti Louvre Dpt of Islamic Arts". academia.edu. ^ a b "Free entry at Louvre due to angry archaeologists". The Local. 5 February 2015. Retrieved 5 February 2015. ^ a b c Gumbel, Peter (31 July 2008). "Sacre Bleu! It's the Louvre Inc". Time Magazine. Retrieved 25 September 2008. ^ a b c d e f Baum, Geraldine (14 May 2006). "Cracking the Louvre's code". Los Angeles Times. Retrieved 25 September 2008. ^ "Louvre, Organization Chart". Louvre.fr Official Site. Archived from the original on 10 May 2008. Retrieved 24 May 2008. ^ a b Farah Nayeri (20 January 2009), Banks compete to manage Louvre's endowment International Herald Tribune. ^ Matlack, Carol (28 July 2008). "The Business of Art: Welcome to The Louvre Inc". Der Spiegel Online. Retrieved 25 September 2008. ^ (in French)Un archéologue prend la direction du Louvre, Le Monde du 3 April 2013. ^ Scarlet Cheng (15 November 2012), Louvre and Sll Francisco museums sign five-year deal Archived 16 June 2013 at the Wayback Machine The Art Newspaper. ^ a b Gentleman, Amelia (1 December 2004). "Lens puts new angle on the Louvre". The Guardian. London. Retrieved 27 February 2008. ^ Riding, Alan (6 March 2007). "The Louvre's Art: Priceless. The Louvre's Name: Expensive". The New York Times. Retrieved 24 April 2008. ^ "Exhibition of Louvre Museum's Items Opens in Tehran". IFP News (Iran Front Page). Retrieved 5 March 2018. ^ a b c Vincent Noce (13 July 2015), Louvre's superstore to go ahead despite protests Archived 15 July 2015 at the Wayback Machine The Art Newspaper. ^ Victoria Stapley-Brown (10 November 2014), Designers chosen for Louvre's €60m storage outpost Archived 11 November 2014 at the Wayback Machine The Art Newspaper. ^ "Rapport Matteoli, Le pillage de l'art en France pendant l'occupation et la situation des 2000 oeuvres confiées aux Musées nationaux, p. 50, 60, 69" (PDF). Retrieved 21 August 2011. ^ "Le Louvre se dit "satisfait" de la restitution des fresques égyptiennes - Culture - Nouvelobs.com". Tempsreel.nouvelobs.com. Retrieved 21 August 2011. ^ "The fabulous collections of the Louvre Museum". ^ a b "Egyptian Antiquities". Musée du Louvre. Archived from the original on 11 March 2008. Retrieved 30 April 2008. ^ "Decorative Arts". Musée du Louvre. Archived from the original on 20 October 2007. Retrieved 20 May 2008. ^ "Forgotten Empire: The World of Ancient Persia". University of California Press. 2006. Retrieved 12 November 2007. ^ a b c "Greek, Etruscan, and Roman Antiquities". Musée du Louvre. Archived from the original on 4 November 2007. Retrieved 30 April 2008. ^ a b "Islamic Art". Musée du Louvre. Archived from the original on 9 November 2007. Retrieved 30 April 2008. ^ a b c "Sculptures". Musée du Louvre. Archived from the original on 7 November 2007. Retrieved 23 April 2008. ^ "Decorative Arts". Musée du Louvre. Archived from the original on 3 December 2007. Retrieved 30 April 2008. ^ (in French) Pierre Rosenberg, Dictionnaire amoureux du Louvre, Plon, Paris, 2007, p. 229. ^ According to Giorgio Vasari, Michelangelo's Leda and the Swan, (now lost) was acquired by Francis I. ^ "Paintings". Musée du Louvre. Archived from the original on 23 March 2008. Retrieved 23 April 2008. ^ "French artists in Louvre Museum". Paris Digest. 2018. Retrieved 13 September 2018. ^ "Galerie de tableaux en très haute définition". c2rmf.fr. ^ "Prints and Drawings". Musée du Louvre. Archived from the original on 20 December 2008. Retrieved 23 April 2008. ^ "How to get here". Louvre Museum. Archived from the original on 21 September 2008. Retrieved 28 September 2008. ^ "'Bad taste' cries as McDonald's moves into 'Mona Lisa' museum". CNN. 7 October 2009. Retrieved 11 May 2010. Alderson, William T.; Alexander, Edward (1996). Museums in motion: an introduction to the history and functions of museums. Walnut Creek, Calif: Published in cooperation with the American Association for State and Local History [by] AltaMira Press. ISBN 0-7619-9155-7. OCLC 33983419. Ahlund, Mikael (2000). Islamic art collections: an international survey. Richmond, Surrey, England: Curzon. ISBN 0-7007-1153-8. OCLC 237132457. Bierman, Irene A (2003). Napoleon in Egypt. Ithaca Press. ISBN 0863722997. Bowkett, Stephen; Porter, Tom (2004). Archispeak: an illustrated guide to architectural terms. London: Spon Press. ISBN 0-415-30011-8. OCLC 123339639. Carbonell, Bettina (2004). Museum Studies: An Anthology of Contexts. Blackwell Pub. ISBN 978-0-631-22825-7. OCLC 52358814. Edwards, Henry Sutherland (1893). Old and New Paris: Its History, Its People, and Its Places. Paris: Cassell and Co. Retrieved 30 April 2008. Hannan, Bill and Lorna (2004). Art for Travellers:France. Northampton, Massachusetts: Interlink Books. ISBN 1-56656-509-X. OCLC 51336501. Lasko, Peter (1995). Ars Sacra, 800–1200. Yale University Press. ISBN 978-0-300-06048-5. OCLC 231858991. McClellan, Andrew (1999). Inventing the Louvre: Art, Politics, and the Origins of the Modern Museum... Berkeley: University of California Press. ISBN 0-520-22176-1. OCLC 40830142. Merryman, John Henry (2006). Imperialism, art and restitution. Cambridge: Cambridge University Press. ISBN 0-521-85929-8. OCLC 183928459. Mignot, Claude (1999). The Pocket Louvre: A Visitor's Guide to 500 Works. New York: Abbeville Press. ISBN 0-7892-0578-5. OCLC 40762767. Mroue, Haas (2003). Frommer's Paris from $90 a Day. Frommer's. ISBN 0-7645-5806-4. OCLC 229256386. Miltoun, Francis (1910). Royal Palaces and Parks of France. L.C. Page & Co.
Lunn, Martin (2004). Da Vinci code Decoded. New York: Disinformation. ISBN 0-9729529-7-7. OCLC 224340425. Nave, Alain (1998). Treasures of the Louvre. Barnes & Noble Publishing. ISBN 0-7607-1067-8. OCLC 40334510. Nora, Pierre; Lawrence D. Kritzman (1996). Realms of Memory. New York: Columbia University Press. ISBN 978-0-231-10926-0. OCLC 234041248. Oliver, Bette Wyn (2007). From Royal to National: The Louvre Museum and the Bibliothèque Nationale. Lexington Books. ISBN 978-0-7391-1861-0. OCLC 70883061. Plant, Margaret (2002). Venice Fragile City. Yale University Press. ISBN 978-0300083866. Popkin, Jeremy D (2015). 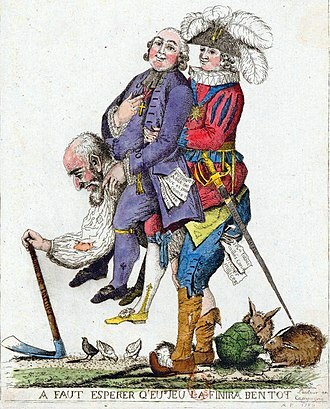 A Short History of the French Revolution, 6th ed. Yale University Press. ISBN 978-0-205-96845-9. Rickman, Gregg (1999). Swiss Banks and Jewish Souls. Transaction Publishers. ISBN 1-56000-426-6. OCLC 40698624. Rogers, Elizabeth A. (2001). Landscape design: a cultural and architectural history. New York: Harry N. Abrams. ISBN 0-8109-4253-4. OCLC 186087857. Strathern, Paul (2009). Napoleon in Egypt. Bantam. ISBN 978-0553385243. OCLC 299706472. Sturdy, David (1995). Science and social status: the members of the Académie des sciences 1666–1750. Woodbridge, Suffolk, U.K.: Boydell Press. ISBN 0-85115-395-X. OCLC 185477008. Wikimedia Commons has media related to Louvre. Etruscan art was produced by the Etruscan civilization in central Italy between the 9th and 2nd centuries BC. From around 600 BC it was influenced by Greek art, which was imported by the Etruscans. Particularly strong in this tradition were figurative sculpture in terracotta, wall-painting and metalworking especially in bronze and engraved gems of high quality were produced. Etruscan sculpture in cast bronze was famous and widely exported, the great majority of survivals come from tombs, which were typically crammed with sarcophagi and grave goods, and terracotta fragments of architectural sculpture, mostly around temples. Tombs have produced all the fresco wall-paintings, which show scenes of feasting, Bucchero wares in black were the early and native styles of fine Etruscan pottery. There was a tradition of elaborate Etruscan vase painting, which sprung from its Greek equivalent, Etruscan temples were heavily decorated with colourfully painted terracotta antefixes and other fittings, which survive in large numbers where the wooden superstructure has vanished. Etruscan art was connected to religion, the afterlife was of major importance in Etruscan art. 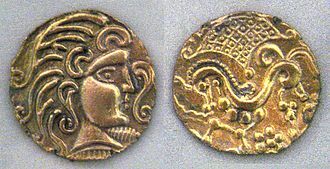 The Etruscans emerged from the preceding Villanovan culture, due to the proximity and/or commercial contact to Etruria, other ancient cultures influenced Etruscan art, such as Greece, Egypt and the Middle East. The apparent simple character in the Hellenistic era conceals an innovative, the Romans would come to absorb the Etruscan culture into theirs but would be greatly influenced by them and their art. 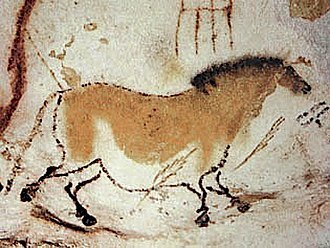 Etruscan art is divided into a number of periods,900 to 675 BC – Early Villanovan period. Already the emphasis on art is evident. Impasto pottery with decoration, or shaped as hut urns. Bronze objects, mostly small except for vessels, were decorated by moulding or by incised lines, small statuettes were mostly handles or other fittings for vessels. 675–575 BC – Oriental or Orientalising period, decoration adopted a Greek and Near Eastern vocabulary with palmettes and other motifs, and the foreign lion was a popular animal to depict. The Louvre Palace is a former royal palace located on the Right Bank of the Seine in Paris, between the Tuileries Gardens and the church of Saint-Germain lAuxerrois. Its present structure has evolved in stages since the 16th century, in 1793 part of the Louvre became a public museum, now the Musée du Louvre, which has expanded to occupy most of the building. The Palace is situated in the right-bank of the River Seine between Rue de Rivoli to the north and the Quai François Mitterrand to the south. To the west is the Jardin des Tuileries and, to the east, the Rue de lAmiral de Coligny, where its most architecturally famous façade, the Louvre Colonnade, the Cour Napoléon and Cour du Carrousel are separated by the street known as the Place du Carrousel. Some 51,615 sq m in the complex are devoted to public exhibition floor space. The Old Louvre occupies the site of the 12th-century fortress of King Philip Augustus and its foundations are viewable in the basement level as the Medieval Louvre department. This structure was razed in 1546 by King Francis I in favour of a royal residence which was added to by almost every subsequent French monarch. King Louis XIV, who resided at the Louvre until his departure for Versailles in 1678, completed the Cour Carrée, the Old Louvre is a quadrilateral approximately 160 m on a side consisting of 8 ailes which are articulated by 8 pavillons. With it, the last external vestiges of the medieval Louvre were demolished, the New Louvre is the name often given to the wings and pavilions extending the Palace for about 500 m westwards on the north and on the south sides of the Cour Napoléon and Cour du Carrousel. This consummation only lasted a few years, however, as the Tuileries was burned in 1871, the northern limb of the new Louvre consists of three great pavilions along the Rue de Rivoli, the Pavillon de la Bibliothèque, Pavillon de Rohan and Pavillon de Marsan. As on the side, three inside pavilions and their wings define three more subsidiary Courts, Cour du Sphinx, Cour Viconti and Cour Lefuel. The Chinese American architect I. M. Pei was selected in 1983 to design François Mitterrands Grand Louvre Project. The ground-level entrance to this complex was situated in the centre of the Cour Napoléon and is crowned by the prominent steel-and-glass pyramid, in a proposal by Kenneth Carbone, the nomenclature of the wings of the Louvre was simplified in 1987 to reflect the Grand Louvres organization. This allows the visitor to avoid becoming totally mystified at the bewildering array of named wings. The origin of the name Louvre is unclear, the French historian Henri Sauval, probably writing in the 1660s, stated that he had seen in an old Latin-Saxon glossary, Leouar is translated castle and thus took Leouar to be the origin of Louvre. According to Keith Briggs, Sauvals theory is often repeated, even in recent books, but this glossary has never seen again. 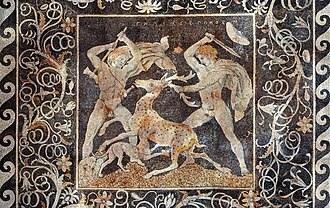 Briggs suggests that H. J. Wolfs proposal in 1969 that Louvre derives instead from Latin Rubras, david Hanser, on the other hand, reports that the word may come from French louveterie, a place where dogs were trained to chase wolves. The Palace of Versailles, Château de Versailles, or simply Versailles, is a royal château in Versailles in the Île-de-France region of France. Versailles is therefore not only as a building, but as a symbol of the system of absolute monarchy of the Ancien Régime. 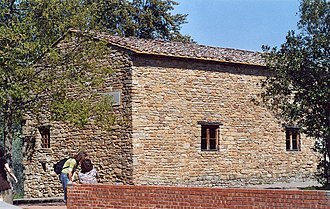 First built by Louis XIII in 1623, as a lodge of brick and stone. The first phase of the expansion was designed and supervised by the architect Louis Le Vau and it culminated in the addition of three new wings of stone, which surrounded Louis XIIIs original building on the north and west. After Le Vaus death in 1670, the work was taken over and completed by his assistant, charles Le Brun designed and supervised the elaborate interior decoration, and André Le Nôtre landscaped the extensive Gardens of Versailles. Le Brun and Le Nôtre collaborated on the fountains, and Le Brun supervised the design. During the second phase of expansion, two enormous wings north and south of the wings flanking the Cour Royale were added by the architect Jules Hardouin-Mansart. He replaced Le Vaus large terrace, facing the garden on the west, with became the most famous room of the palace. The Royal Chapel of Versailles, located at the end of the north wing, was begun by Mansart in 1688. One of the most baffling aspects to the study of Versailles is the cost – how much Louis XIV, owing to the nature of the construction of Versailles and the evolution of the role of the palace, construction costs were essentially a private matter. Initially, Versailles was planned to be a residence for Louis XIV and was referred to as the kings house. Once Louis XIV embarked on his campaigns, expenses for Versailles became more of a matter for public record. To counter the costs of Versailles during the years of Louis XIVs personal reign. Accordingly, all materials that went into the construction and decoration of Versailles were manufactured in France, even the mirrors used in the decoration of the Hall of Mirrors were made in France. While Venice in the 17th century had the monopoly on the manufacture of mirrors, to meet the demands for decorating and furnishing Versailles, Colbert nationalised the tapestry factory owned by the Gobelin family, to become the Manufacture royale des Gobelins. The painting is a portrait of Lisa Gherardini, the wife of Francesco del Giocondo, and is in oil on a white Lombardy poplar panel, and is believed to have been painted between 1503 and 1506. 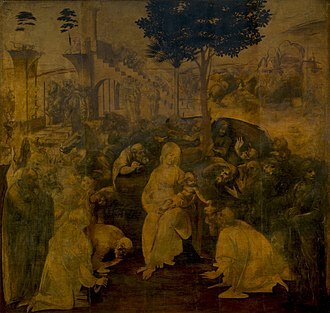 Leonardo may have continued working on it as late as 1517 and it was acquired by King Francis I of France and is now the property of the French Republic, on permanent display at the Louvre Museum in Paris since 1797. Mona in Italian is a form of address originating as ma donna – similar to Ma’am, Madam. This became madonna, and its contraction mona, the title of the painting, though traditionally spelled Mona, is commonly spelled in modern Italian as Monna Lisa but this is rare in English. Vasaris account of the Mona Lisa comes from his biography of Leonardo published in 1550,31 years after the artists death and it has long been the best-known source of information on the provenance of the work and identity of the sitter. Leonardos assistant Salaì, at his death in 1525, owned a portrait which in his papers was named la Gioconda. Dated October 1503, the note was written by Leonardos contemporary Agostino Vespucci and this note likens Leonardo to renowned Greek painter Apelles, who is mentioned in the text, and states that Leonardo was at that time working on a painting of Lisa del Giocondo. The model, Lisa del Giocondo, was a member of the Gherardini family of Florence and Tuscany, the painting is thought to have been commissioned for their new home, and to celebrate the birth of their second son, Andrea. The Italian name for the painting, La Gioconda, means jocund or, the jocund one, in French, the title La Joconde has the same meaning. Before that discovery, scholars had developed several alternative views as to the subject of the painting, some argued that Lisa del Giocondo was the subject of a different portrait, identifying at least four other paintings as the Mona Lisa referred to by Vasari. Several other women have been proposed as the subject of the painting, the consensus of art historians in the 21st century maintains the long-held traditional opinion, that the painting depicts Lisa del Giocondo. Leonardo da Vinci began painting the Mona Lisa in 1503 or 1504 in Florence, although the Louvre states that it was doubtless painted between 1503 and 1506, the art historian Martin Kemp says there are some difficulties in confirming the actual dates with certainty. According to Leonardos contemporary, Giorgio Vasari, after he had lingered over it four years, Leonardo, in his life, is said to have regretted never having completed a single work. 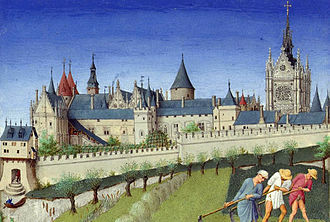 In 1516, Leonardo was invited by King François I to work at the Clos Lucé near the castle in Amboise. It is believed that he took the Mona Lisa with him, bambach has concluded that da Vinci probably continued refining the work until 1516 or 1517. Upon his death, the painting was inherited with other works by his pupil, Francis I bought the painting for 4,000 écus and kept it at Palace of Fontainebleau, where it remained until Louis XIV moved the painting to the Palace of Versailles. 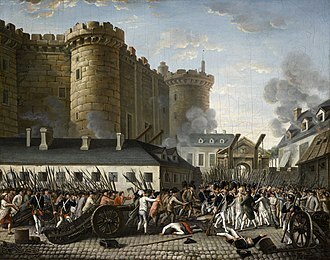 After the French Revolution, it was moved to the Louvre, during the Franco-Prussian War it was moved from the Louvre to the Brest Arsenal. The Seine is a 777-kilometre-long river and an important commercial waterway within the Paris Basin in the north of France. It rises at Source-Seine,30 kilometres northwest of Dijon in northeastern France in the Langres plateau, flowing through Paris and it is navigable by ocean-going vessels as far as Rouen,120 kilometres from the sea. 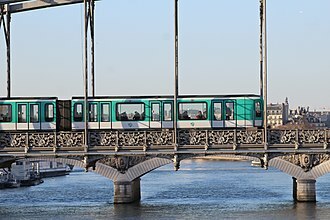 There are 37 bridges within Paris and dozens more spanning the river outside the city, examples in Paris include the Pont Alexandre III and Pont Neuf, the latter of which dates back to 1607. Outside the city, examples include the Pont de Normandie, one of the longest cable-stayed bridges in the world, the Seine rises in the commune of Source-Seine, about 30 kilometres northwest of Dijon. The source has been owned by the city of Paris since 1864, a number of closely associated small ditches or depressions provide the source waters, with an artificial grotto laid out to highlight and contain a deemed main source. The grotto includes a statue of a nymph, on the same site are the buried remains of a Gallo-Roman temple. Small statues of the dea Sequana Seine goddess and other ex voti found at the place are now exhibited in the Dijon archeological museum. The Seine is dredged and oceangoing vessels can dock at Rouen,120 kilometres from the sea, commercial riverboats can use the river from Bar-sur-Seine,560 kilometres to its mouth. At Paris, there are 37 bridges, the river is only 24 metres above sea level 446 kilometres from its mouth, making it slow flowing and thus easily navigable. The Seine Maritime,105.7 kilometres from the English Channel at Le Havre to Rouen, is the portion of the Seine used by ocean-going craft. The tidal section of the Seine Maritime is followed by a section with four large multiple locks until the mouth of the Oise at Conflans-Sainte-Honorine. Multiple locks at Bougival / Chatou and at Suresnes lift the vessels to the level of the river in Paris, upstream from Paris seven locks ensure navigation to Saint Mammès, where the Loing mouth is situated. Through an eighth lock the river Yonne is reached at Montereau-Fault-Yonne, from the mouth of the Yonne, larger ships can continue upstream to Nogent-sur-Seine. Greek art began in the Cycladic and Minoan civilization, and gave birth to Western classical art in the subsequent Geometric and Classical periods. Greek art is mainly five forms, sculpture, artistic production in Greece began in the prehistoric pre-Greek Cycladic and the Minoan civilizations, both of which were influenced by local traditions and the art of ancient Egypt. There are three divisions of the stages of ancient Greek art that correspond roughly with historical periods of the same names. These are the Archaic, the Classical and the Hellenistic, the Archaic period is usually dated from 1000 BC. Of course, different forms of art developed at different speeds in different parts of the Greek world, there was no sharp transition from one artistic period to another. The art of ancient Greece has exercised an influence on the culture of many countries from ancient times until the present. In the West, the art of the Roman Empire was largely derived from Greek models, following the Renaissance in Europe, the humanist aesthetic and the high technical standards of Greek art inspired generations of European artists. Pottery was either red with black designs or black with red designs, Byzantine art is the term created for the Eastern Roman Empire from about the 5th century until the fall of Constantinople in 1452. It can be used for the art of people of the former Byzantine Empire under the rule of Ottoman Empire after 1453, in some respects the Byzantine artistic tradition has continued in Russia and other Eastern Orthodox countries to the present day. Byzantine art grew from the art of ancient Greece and, at least before 1453, never lost sight of its classical heritage, the most profound of these was that the humanist ethic of ancient Greek art was replaced by the Christian ethic. If the purpose of art was the glorification of man. One of the most important forms of Byzantine art was, and still is, like the Cretan school it combined Byzantine traditions with an increasing Western European artistic influence, and saw the first signiand the National Gallery of Art in Washington, D. C. The Heptanese School of painting succeeded the Cretan School as the school of Greek post-Byzantine painting after Crete fell to the Ottomans in 1669. 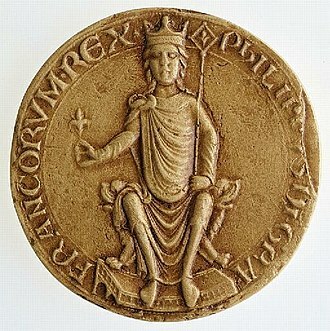 Philip II, known as Philip Augustus, was King of France from 1180 to 1223, a member of the House of Capet. Philips predecessors had been known as kings of the Franks, but from 1190 onward, Philip became the first French monarch to style himself king of France. The son of King Louis VII and his wife, Adèle of Champagne, he was originally nicknamed Dieudonné God-given because he was the first son of Louis VII. 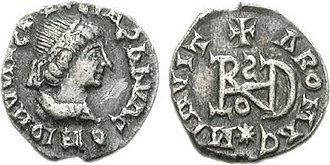 Philip was given the nickname Augustus by the chronicler Rigord for having extended the Crown lands of France so remarkably, the military actions surrounding the Albigensian Crusade helped prepare the expansion of France southward. Philip did not participate directly in these actions, but he allowed his vassals, Philip transformed France from a small feudal state into the most prosperous and powerful country in Europe. He checked the power of the nobles and helped the towns to free themselves from seigniorial authority and he built a great wall around Paris, re-organized the French government and brought financial stability to his country. Philip was born in Gonesse on 21 August 1165 and he spent much of the following night attempting to find his way out, but to no avail. Exhausted by cold and fatigue, he was discovered by a peasant carrying a charcoal burner. 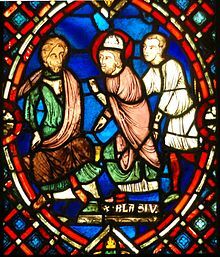 His father went on pilgrimage to the Shrine of Thomas Becket to pray for Philips recovery and was told that his son had indeed recovered, however, on his way back to Paris, he suffered a stroke. 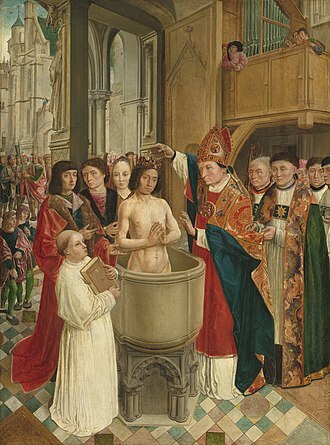 In declining health, Louis VII had his 14-year-old son crowned and anointed as king at Rheims on 1 November 1179 by the Archbishop Guillaume aux Blanches Mains. He was married on 28 April 1180 to Isabelle of Hainaut, the daughter of Baldwin V, Count of Hainaut, and Margaret I, Countess of Flanders, who brought the County of Artois as her dowry. From the time of his coronation, all power was transferred to Philip. 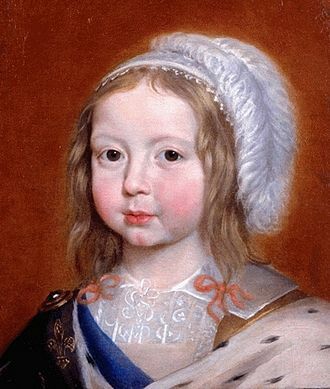 Eventually, Louis died on 18 September 1180, while the royal demesne had increased under Philip I and Louis VI, it had diminished slightly under Louis VII. In April 1182, partially to enrich the French crown, Philip expelled all Jews from the demesne, Philips eldest son Louis was born on 5 September 1187 and inherited the County of Artois in 1190, when his mother Isabelle died. An art museum or art gallery is a building or space for the exhibition of art, usually visual art. Museums can be public or private, but what distinguishes a museum is the ownership of a collection, the term is used for both public galleries, which are non-profit or publicly owned museums that display selected collections of art. On the other hand, private galleries refers to the commercial enterprises for the sale of art, both types of gallery may host traveling exhibits or temporary exhibitions including art borrowed from elsewhere. In broad terms, in North American usage, the word gallery alone often implies a private gallery, the term contemporary art gallery refers usually to a privately owned for-profit commercial gallery. These galleries are found clustered together in large urban centers. Smaller cities are home to at least one gallery, but they may be found in towns or villages. Contemporary art galleries are open to the general public without charge, however. They usually profit by taking a portion of art sales, from 25% to 50% is typical, there are many non-profit or collective galleries. Some galleries in cities like Tokyo charge the artists a flat rate per day, curators often create group shows that say something about a certain theme, trend in art, or group of associated artists. Galleries sometimes choose to represent artists exclusively, giving them the opportunity to show regularly, a gallerys definition can include the artist cooperative or artist-run space, which often operates as a space with a more democratic mission and selection process. A vanity gallery is an art gallery that charges fees from artists in order to show their work, the shows are not legitimately curated and will frequently or usually include as many artists as possible. Most art professionals are able to identify them on an artists resume, University art museums and galleries constitute collections of art that are developed and maintained by all kinds of schools, community colleges and universities. This phenomenon exists in both the West and East, making it a global practice, although largely overlooked, there are over 700 university art museums in America alone. In the history of Europe, the Middle Ages or Medieval Period lasted from the 5th to the 15th century. 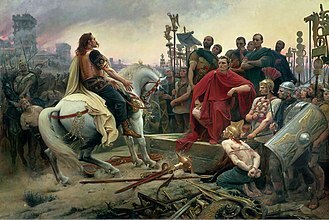 It began with the fall of the Western Roman Empire and merged into the Renaissance, the Middle Ages is the middle period of the three traditional divisions of Western history, classical antiquity, the medieval period, and the modern period. The medieval period is subdivided into the Early, High. Population decline, counterurbanisation and movement of peoples, the large-scale movements of the Migration Period, including various Germanic peoples, formed new kingdoms in what remained of the Western Roman Empire. In the seventh century, North Africa and the Middle East—once part of the Byzantine Empire—came under the rule of the Umayyad Caliphate, although there were substantial changes in society and political structures, the break with classical antiquity was not complete. The still-sizeable Byzantine Empire survived in the east and remained a major power, the empires law code, the Corpus Juris Civilis or Code of Justinian, was rediscovered in Northern Italy in 1070 and became widely admired in the Middle Ages. 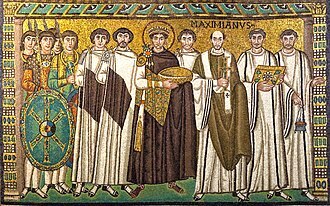 In the West, most kingdoms incorporated the few extant Roman institutions, monasteries were founded as campaigns to Christianise pagan Europe continued. The Franks, under the Carolingian dynasty, briefly established the Carolingian Empire during the 8th, the Crusades, first preached in 1095, were military attempts by Western European Christians to regain control of the Holy Land from Muslims. Kings became the heads of centralised nation states, reducing crime and violence, intellectual life was marked by scholasticism, a philosophy that emphasised joining faith to reason, and by the founding of universities. Controversy and the Western Schism within the Catholic Church paralleled the conflict, civil strife. Cultural and technological developments transformed European society, concluding the Late Middle Ages, the Middle Ages is one of the three major periods in the most enduring scheme for analysing European history, classical civilisation, or Antiquity, the Middle Ages, and the Modern Period. Medieval writers divided history into periods such as the Six Ages or the Four Empires, when referring to their own times, they spoke of them as being modern. In the 1330s, the humanist and poet Petrarch referred to pre-Christian times as antiqua, leonardo Bruni was the first historian to use tripartite periodisation in his History of the Florentine People. Bruni and argued that Italy had recovered since Petrarchs time. The Middle Ages first appears in Latin in 1469 as media tempestas or middle season, in early usage, there were many variants, including medium aevum, or middle age, first recorded in 1604, and media saecula, or middle ages, first recorded in 1625. The alternative term medieval derives from medium aevum, tripartite periodisation became standard after the German 17th-century historian Christoph Cellarius divided history into three periods, Ancient and Modern. The most commonly given starting point for the Middle Ages is 476, for Europe as a whole,1500 is often considered to be the end of the Middle Ages, but there is no universally agreed upon end date. Paris is the capital and most populous city of France. It has an area of 105 square kilometres and a population of 2,229,621 in 2013 within its administrative limits, the agglomeration has grown well beyond the citys administrative limits. By the 17th century, Paris was one of Europes major centres of finance, fashion and the arts, and it retains that position still today. The aire urbaine de Paris, a measure of area, spans most of the Île-de-France region and has a population of 12,405,426. It is therefore the second largest metropolitan area in the European Union after London, the Metropole of Grand Paris was created in 2016, combining the commune and its nearest suburbs into a single area for economic and environmental co-operation. Grand Paris covers 814 square kilometres and has a population of 7 million persons, the Paris Region had a GDP of €624 billion in 2012, accounting for 30.0 percent of the GDP of France and ranking it as one of the wealthiest regions in Europe. The city is a rail and air-transport hub served by two international airports, Paris-Charles de Gaulle and Paris-Orly. 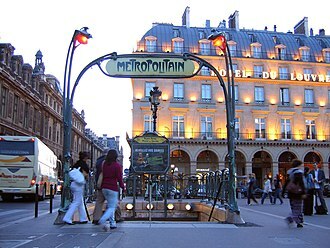 Opened in 1900, the subway system, the Paris Métro. It is the second busiest metro system in Europe after Moscow Metro, Paris Gare du Nord is the busiest railway station in the world outside of Japan, with 262 millions passengers in 2015. In 2015, Paris received 22.2 million visitors, making it one of the top tourist destinations. The association football club Paris Saint-Germain and the rugby union club Stade Français are based in Paris, the 80, 000-seat Stade de France, built for the 1998 FIFA World Cup, is located just north of Paris in the neighbouring commune of Saint-Denis. Paris hosts the annual French Open Grand Slam tennis tournament on the red clay of Roland Garros, Paris hosted the 1900 and 1924 Summer Olympics and is bidding to host the 2024 Summer Olympics. The name Paris is derived from its inhabitants, the Celtic Parisii tribe. Thus, though written the same, the name is not related to the Paris of Greek mythology. In the 1860s, the boulevards and streets of Paris were illuminated by 56,000 gas lamps, since the late 19th century, Paris has been known as Panam in French slang. Inside the Pyramid: the view of the Louvre Museum in Paris from the underground lobby of the Pyramid. The Louvre in Paris, France, was the most visited art museum in the world in 2017. The art collection at the Palace of Versailles in France was periodically open for 'respectable' public viewing. The British Museum, established in 1753 at the Montagu House as one of the earliest national collections open to the public. University of Tartu Art Museum is the oldest museum in Estonia. The castle from the south and Seine river around the year 1200, as imagined on an etching from c. 1800. The Louvre in 1380 (under Charles V) as imagined in 1885. Plan from around 1880 of the Louvre castle in 1380 after the construction of the Charles V wall. The Louvre in 1622. Half-medieval and half-Renaissance. Remains of the Wall of Philip II Augustus built around Paris before he went to the Crusades. The segment pictured here is found in the Rue des Jardins-Saint-Paul, Paris. The Count of Provence and his brother Louis Auguste, Duke of Berry (later Louis XVI), depicted in 1757 by François-Hubert Drouais. Charles as Count of Artois (1798). Portrait by Henri-Pierre Danloux. A Blue plaque at 72 South Audley Street, Mayfair, London, his home between 1805 and 1814. 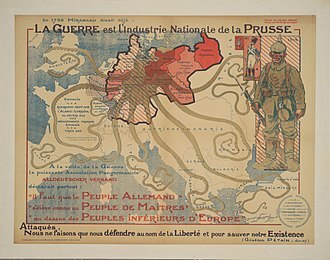 A French propaganda poster from 1917 is captioned with an 18th-century quote: "Even in 1788, Mirabeau was saying that War is the National Industry of Prussia." The Sacré-Cœur Basilica was built as a symbol of the Ordre Moral. In France, children were taught in school not to forget the lost regions of Alsace-Lorraine, which were coloured in black on maps. The front side of the Cross of Lothair (c. 1000), a classic example of "Ars Sacra"
Arts and Crafts movement "Artichoke" wallpaper by Morris and Co.
A margin note by Agostino Vespucci (visible at right) discovered in a book at Heidelberg University. Dated 1503, it states that Leonardo was working on a portrait of Lisa del Giocondo. The Mona Lisa on display in the Uffizi Gallery, in Florence, 1913. Museum director Giovanni Poggi (right) inspects the painting. Crafted by Hughes Sambin (1570-1600), double cabinet features the combination of architectural elements and relief carving that is characteristic of French furniture of the period. 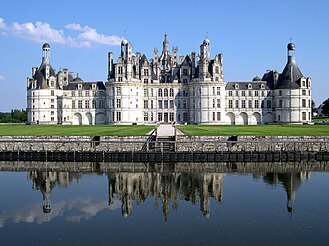 Château de Montsoreau, Loire Valley (1443-1453). Virgin and Child Surrounded by Angels, Melun Diptych by Jean Fouquet, c.1450. The Embarkation for Cythera, 1717, was Antoine Watteau's reception piece for the Académie Royale de Peinture et de Sculpture.